While the Arctic Freezer 13 is still young, Arctic today announces its bigger brother – the Freezer 13 Pro. With its four U-shaped 8mm high performance heatpipes and the new cross blow fan it brings up to 300 watts of cooling performance – that’s more than enough for any CPU. proudly presents the new flagship in the Freezer 13 series – Freezer 13 PRO.The new CPU cooler incorporates an innovative Cross-Blow technology to provide unmatched cooling performance for professional systems. The Cross-Blow technology is cooling down the Northbridge and voltage regulators on the main board specifically. Equipped with an additional 50 mm PWM-controlled fan at the base of the CPU cooler, this extra downward blowing fan would help generating airflow to other chipset parts. This, thus, dramatically lowers the temperature of the surrounding components near the CPU. Superior in its ground-breaking engineering design, the Freezer 13PRO overpowers its competitors by generating up to 300W of coolingcapacity. 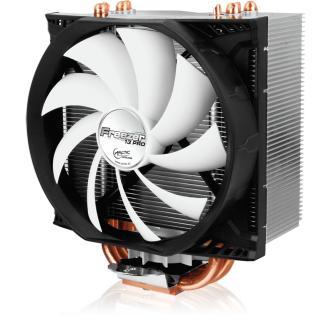 Featuring an ultra-quiet 120 mm PWM-controlled fan withfour U-shaped 8mm copper heatpipes, the Freezer 13 PRO is all set forinaudible and massive heat dissipation. The mega-sized CPU cooling fanguarantees adequate airflow through the aluminum fins in the heatsink. Such meticulously engineered mechanism effectively and efficientlytransfers the emitted heat away from the core of the CPU.The entire installation process of the Freezer 13 PRO is very simple. The unique mounting system via push pins offers excellent stability. With a fiber reinforced retention module, the plastic frame is strong enough to sustain the heavy weight of the CPU cooler. The pre-applied ARCTIC MX-4 thermal compound guarantees high thermal conductivity while making the installation a quick and clean process as well.Aiming to cope with constant changes in PCs and massive heat output, this new CPU cooler is targeted at PC enthusiasts modding on current high-end PC platforms, including a wide range of Intel and AMD CPUs. It is also compatible with the newest Intel Sandy Bridge LGA 1155 processors. again, brings affordable and innovative cooling solution to computer enthusiasts and overclockers.